Four years ago today, on March 26, 2010, Lily was taken over state lines from North Carolina where she was born to my home state of Virginia where she would forever remain on this Earth. Her spirit was already with her Creator, but her precious little body would be layed to rest in Virginia. I am not sure how it all worked out, but we were able to transport her in the "little white box" in our car with us. I am sure it would have cost a lot of money to have her driven/flown up by someone else, so I am incredibly thankful we were able to do this. It also felt more natural for her family to take her. We kept her with us until the burial. The funeral home in NC brought her to our home the day we would be driving up to Virginia. We were able to bring her inside our house, what was to be her home. Where she would have come back from the hospital to. I am thankful she was able to come here, even just that once. I remember I sat in the backseat with the white box on the seat beside me and my mom and sister sat up front. 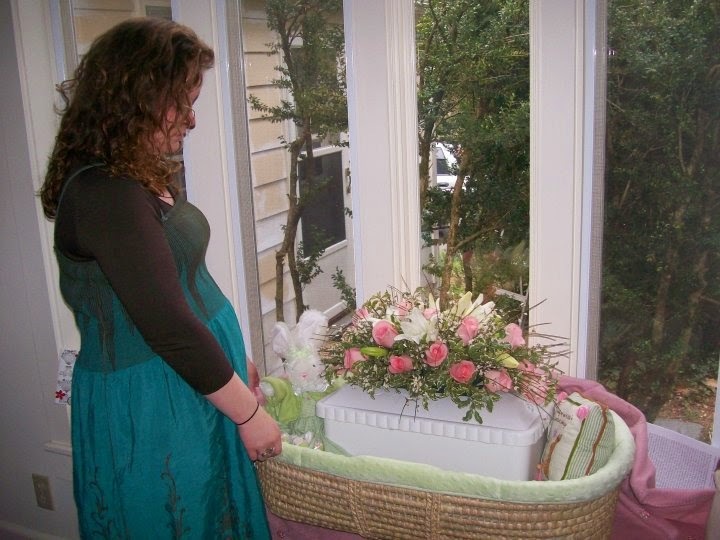 We listened to the Jewel "Lullaby" CD, which was my favorite from pregnancy. On the car ride up, I wrote Lily a letter that I was to share at her memorial service that evening. I usually get really carsick if I attempt to do anything like read or write, but I didn't this time. I knew I was meant to do this. I thought I would be way too much of an emotional wreck to share, but God gave me the words and the strength. That evening, we had a celebration of LIFE/memorial service for Lily at my Aunt Nana and Uncle Bill's house in Crozet. Friends and family gathered together for my little girl. It was a very bittersweet time of mourning her loss, yet celebrating her life. You can read all about this beautiful celebration by clicking HERE.